← It is international KJ appreciation day! 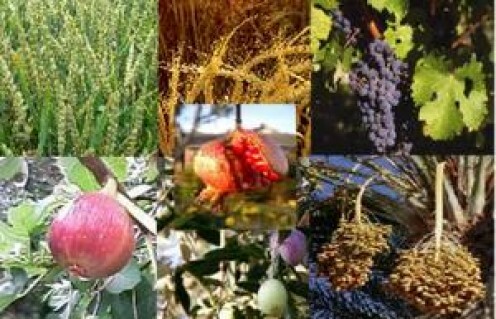 Tu b’Shevat higia! Tu b’Shevat is here! Tonight begins the 15th day of the month of Shevat. In Jewish tradition, this is one of four New Years. That’s right, there are four new years. 15 Shevat is the new year for trees (if you want more info on this look in Mishnah Rosh Hashanah 1:1). There are many customs surrounding this holiday, mostly centered on the Land of Israel and celebrating trees! I will of course share that at this very moment it is snowing in Toronto and the thought of planting trees is quite absurd at this time of year (though I guess starting with a seed and working up from there to put a sapling in the ground come spring is possible). Wheat beer, another beer (barley based will be the assumption), pom-tini, honey beer (or maybe hot tea with honey), wine, dirty martini, and then there is the fig. I’m just not sure what to do with this one, though if there were fresh figs around it could be a garnish on something, I’m sure. Anyone have an idea of what to do with the fig? What other drink concoctions can you think of? I hope however you celebrate, your Tu b’Shevat is a meaningful reminder of the power of nature in our lives and the importance of the trees all around us! This entry was posted in holidays, Israel, Temple Sinai, Torah. Bookmark the permalink.